In this Aug. 15, 2016, file photo, Assemblyman Joaquin Arambula, D-Kingsburg, speaks at the Capitol in Sacramento, Calif. The California state lawmaker has been arrested on suspicion of child cruelty. Fresno Police Department Lt. Mark Hudson said Tuesday, Jan. 11, 2018, that Arambula of Fresno was arrested on suspicion of a misdemeanor charge of willful cruelty to a child. The Fresno Bee reports Arambula was cited and released Monday. A state lawmaker took a temporary leave of absence on Tuesday while disputing a misdemeanor charge of cruelty to his young daughter as "false and unthinkable." 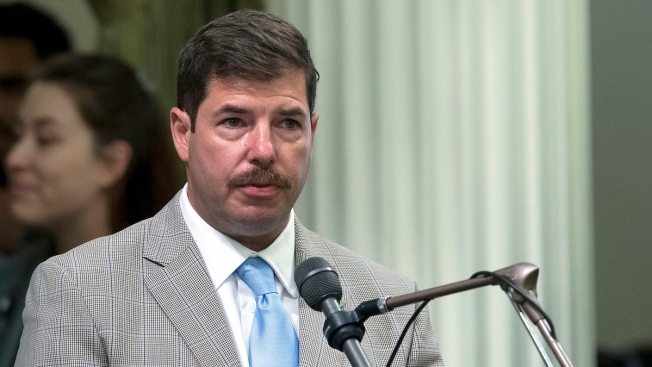 Assemblyman Joaquin Arambula acted hours after Fresno County District Attorney Lisa Smittcamp announced that he is charged with inflicting unjustifiable physical pain or mental suffering on a child. "My wife and I are shocked that the District Attorney has decided to file charges. The allegation that I may have harmed one of my daughters is false and unthinkable," the Fresno Democrat said in a statement issued through his lawyer. "While politics may have influenced the decision to file, we are confident that our judicial system will find this allegation to be false. However, I have voluntarily taken a temporary leave of absence from the Assembly and have directed my attorney to request a speedy trial so this issue can be resolved as quickly as possible." The maximum sentence is six months in jail. Smittcamp's office said there would be no further comment on the case pending the outcome of the trial, and did not respond to Arambula's allegation that politics influenced her decision. Neither prosecutors nor Arambula's attorneys, Margarita Martinez-Baly and Michael Aed, provided details on the allegations. Arambula, 41, was arrested and soon released in December after officials at Dailey Elementary Charter School learned of an injury on his 7-year-old daughter and reported it to child protective services and the police. His three daughters, ages 3, 6 and 7, stayed with his parents for two nights but were then allowed to return home to Arambula and his wife, Elizabeth. Arambula is a former emergency room physician who was elected in 2016 to represent parts of Fresno County. Medical Board of California spokesman Carlos Villatoro said the board is also looking into the allegations. He is set to be arraigned Wednesday. He said in December that he had spanked his daughter as discipline, calling it a tool he rarely uses. But Fresno Police Chief Jerry Dyer disputed that it was a simple spanking on the buttocks. "There was an injury," Dyer said at the time. "I can't get into the details of where (Arambula's daughter's) injury was, but it was not on the buttocks." Dyer said Arambula was arrested on suspicion of a misdemeanor, not a felony, because the injury did not require medical attention. He said spanking a child is generally legal if it's in a fleshy area such as the buttocks but not if it's in a place likely to cause injury like the face. Democratic Assembly Speaker Anthony Rendon did not immediately comment.